On Saturday I went to Bed, Bath, and Beyond (it’s next to Sally’s, so I was in the plaza anyway) to look for a way to store my polish. I had thought about the ever-popular Helmers from Ikea, and the wallet-friendly spoofs from Michael’s that polish ladies call “Melmers,” but I figured there would be something good at BBB. It was actually perfect timing, because the store is all set for back-to-school with dorm room essentials. The drawers pull out but have a stopper so they can’t come out the entire way. 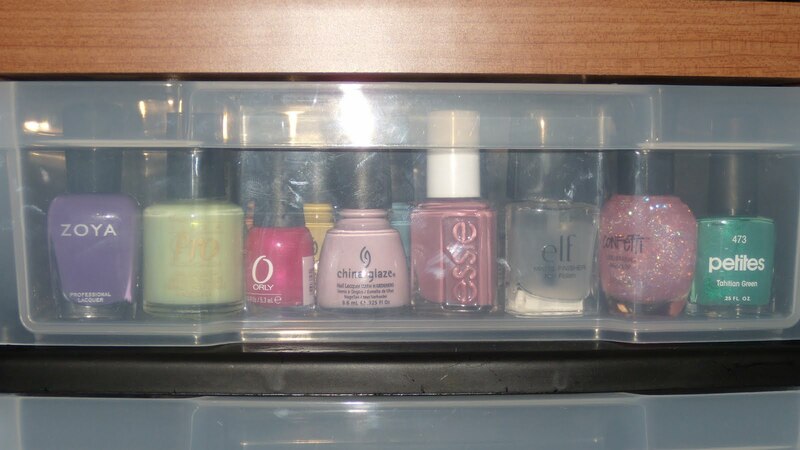 The top two drawers are smaller, so I was concerned about whether the polish bottles would fit. 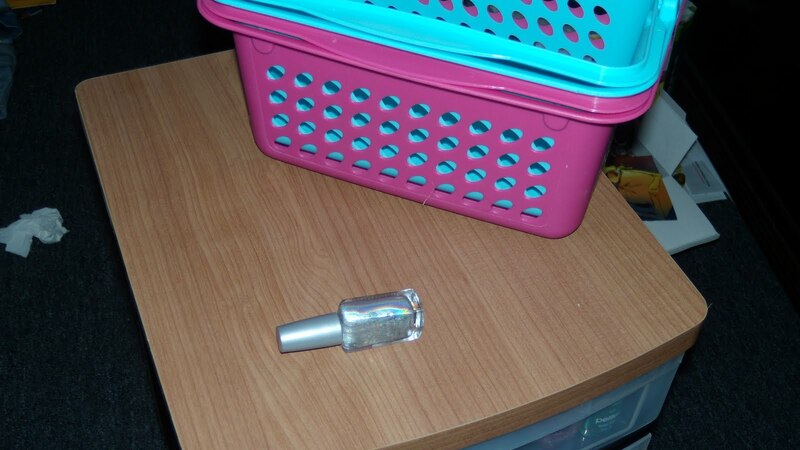 What I found is that tall bottles like China Glaze and OPI don’t stand inside. But many other brands do. This is an example of the small drawers. You can see that brands that fit include Zoya, Nina Ultra Pro, Orly mini, China Glaze mini, Essie, e.l.f., Confetti (I think that’s the CVS store brand), and Petites. And now, here are some pictures of each drawer. 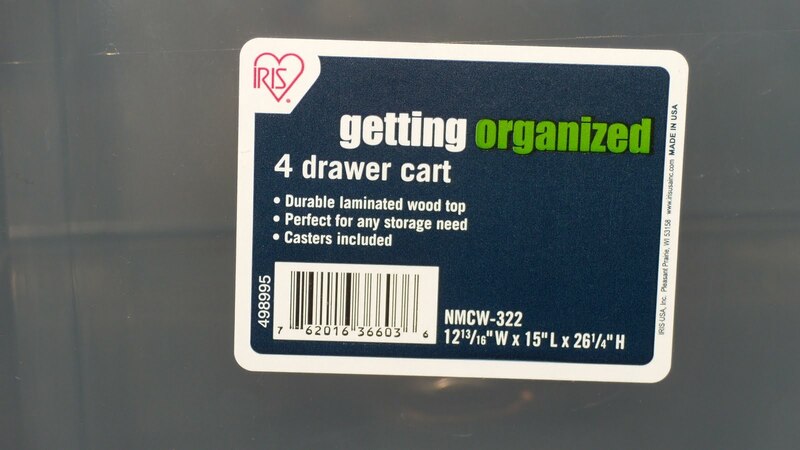 The little white organizer bins were at Target, three for $1. 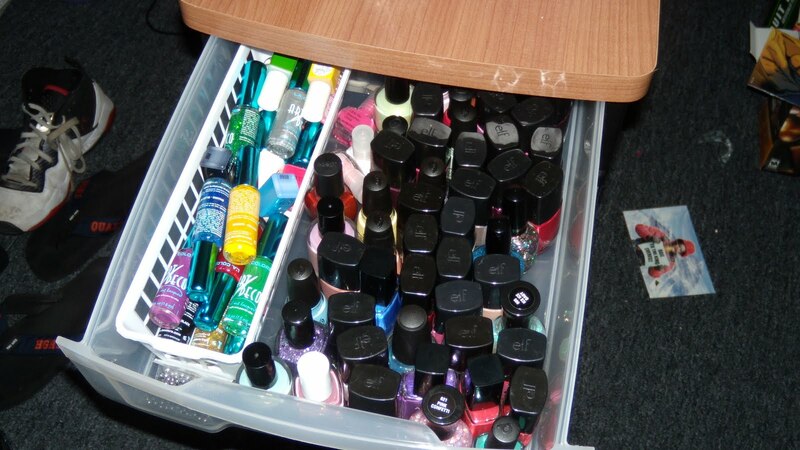 The top drawer has most of the short bottles, plus the bin has Art Deco nail art pens by L.A. Colors, which I got from the Dollar Tree. And you might see my metal “monster beads” in front of the bin – they were really inexpensive at TKB Trading. The second drawer has all of my Zoyas, my Seche Vite top coat, my stamping supplies including both sets of Bundle Monster plates plus the free Hello Kitty plate from Born Pretty, and the white bin has nail art supplies. You can see my set of dotting pens, plus there is stuff like glitter, rhinestones, and nail stickers. 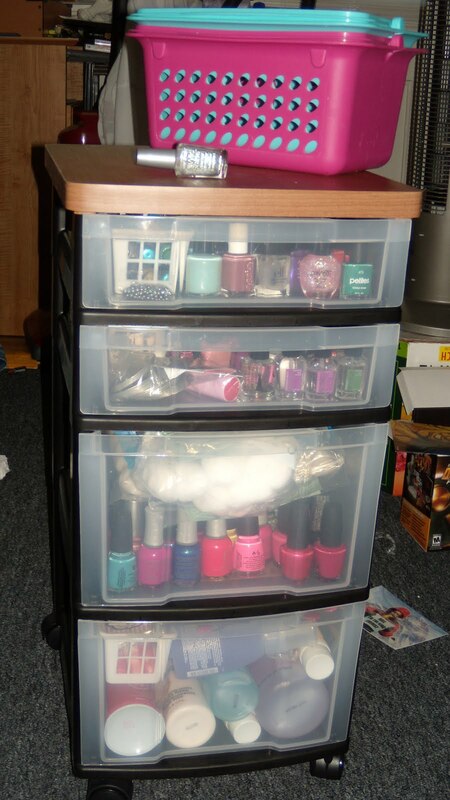 The third drawer has OPI, Orly, Chine Glaze, Nicole by OPI, and any other polishes too tall for the top two drawers. 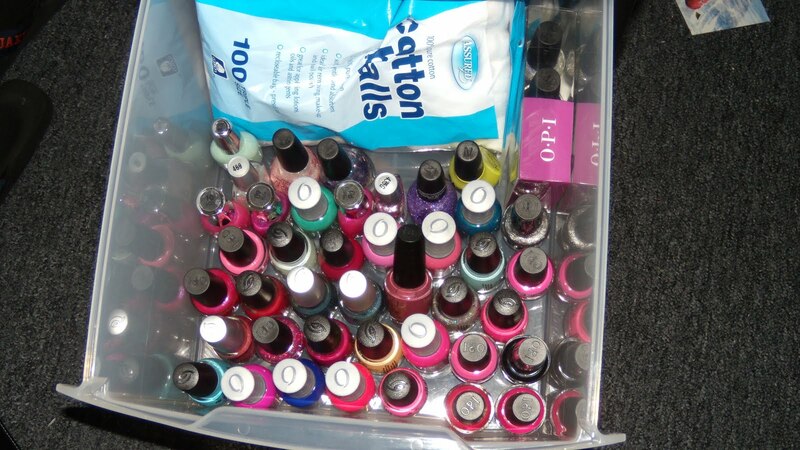 I also have three and a half bags of cotton balls (only one is in the picture, so you can see the polishes). The bottom drawer has polish remover, plus manicure and pedicure tools, foot lotions, and pretty much anything else that didn’t fit in the other drawers. I love the Zoya Remove+ polish remover (did you know there’s a promo going on right now where you can get a free one? ), but I’ve gotten tips from my PAA girls that pure acetone is better for cleaning stamping plates, so I have both. The fuchsia plastic in the right back part of the drawer is a blow-up foot bath that I got in a children’s pedicure kit toy at Barnes and Noble. 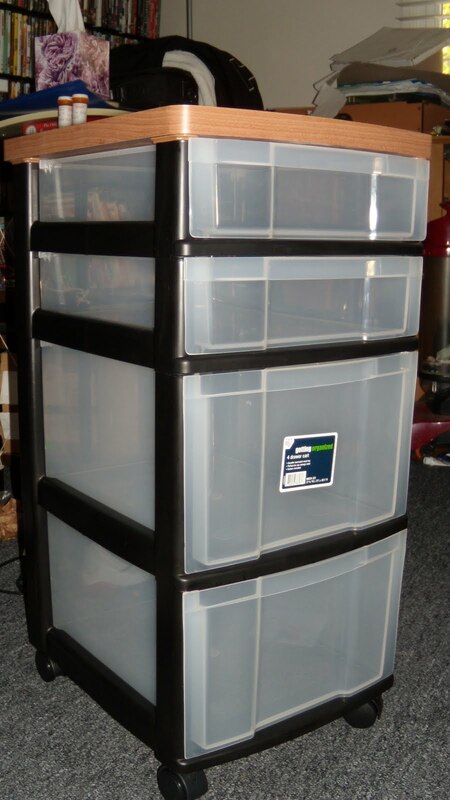 I like that it’s compact – it fits in a small space for storage. The top of the storage unit. Two plastic bins that I can fill with supplies when I want to do my nails in another room, plus gLORIous, a Spectraflair top coat made by Lori in PAA (named by another woman in the group). gLORIous is amazing because it turns any polish into a holo. And below, the entire storage unit, filled. 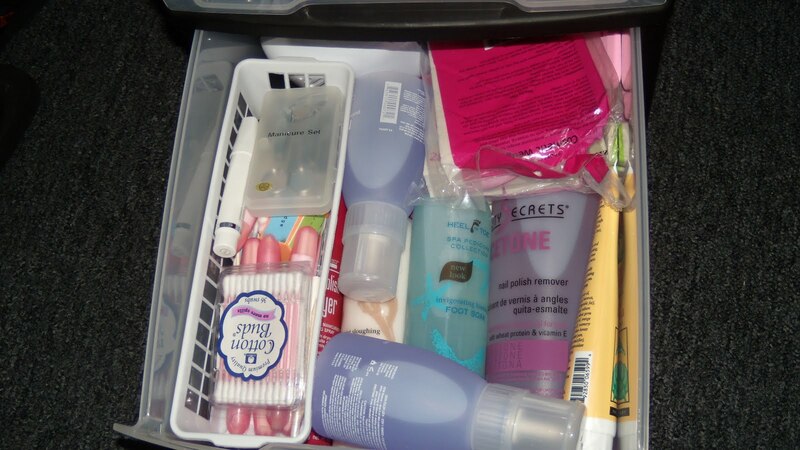 My collection didn’t fit into the Caboodles train case anymore, and this is a much better way of storing everything. 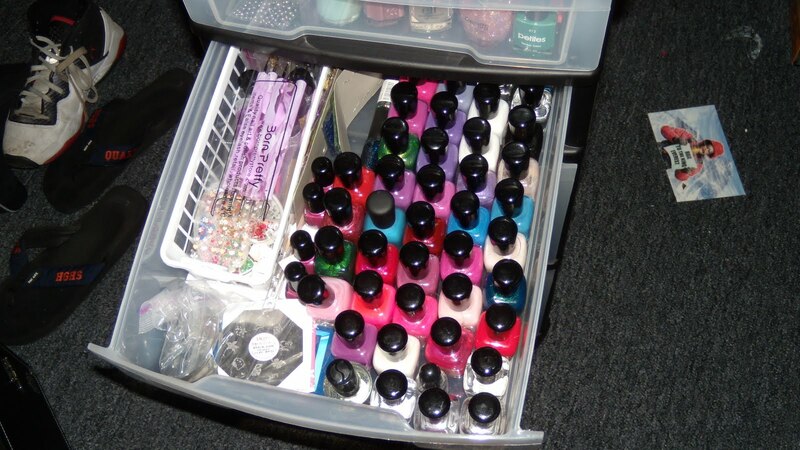 Have you posted about how you store your polish and supplies? Share a link and I’ll go take a look! omg nice stash!you're going to need more than that when your collcetion grows 🙂 new follower of yours btw hope you do the same! Thanks! I know, my husband already shook his head when he saw this. He thinks I have too much polish already. Like that's even possible! 🙂 Thanks for following!